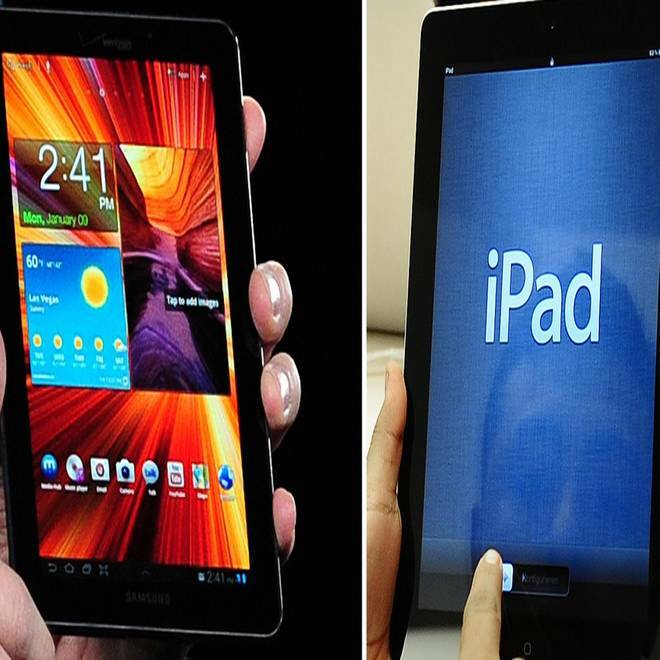 This combination of file photos shows the Samsung Galaxy tablet(L) and the Apple iPad. Jury selection was set to open July 30, 2012 in a U.S. federal court in the blockbuster patent case pitting Apple against Samsung. (Updated 3:23 p.m. Eastern) While patent law doesn’t have a reputation for being scintillating stuff, the lawsuit between Apple and Samsung is the exception. How the case is decided could have a potentially serious impact on nearly every American who uses a smartphone. Apple contends that the Korean manufacturer ripped off the iPhone’s look and feel. "It's the cool factor, and they feel like Samsung took that," said Joseph A. Mandour, managing partner of Mandour & Associates. The company is seeking $2.5 billion in damages and permanent injunctions against sales. Legal experts say the case and its inevitable appeals will probably drag on for years. Neither side seems inclined to settle because there isn't a clear-cut prediction for the outcome, especially because the case is being tried before a jury. A partial or complete victory by Apple could, in the most extreme case, lead to a ban on sales. "(If) there’s some sort of an injunction, that becomes a loss for the consumer market in general," said Will Stofega, mobile devices analyst at International Data Corporation. Analysts say it's more likely that an Apple victory would force changes to the way Samsung’s phones and tablets look and function. "Samsung's probably got a work-around," said Kevin G. Rivette, patent expert and managing partner at 3LP. In Germany, for instance, Samsung added a slim frame around the front of a contested Galaxy tablet to get around Apple’s contention that a wholly glass front was its invention. Small tweaks might be enough to bring Samsung within the letter of the law here, too. On the other hand, "If Apple wins on some of the really fundamental technologies... consumers will notice," said Polk Wagner, professor at University of Pennsylvania Law School. "Dragging, scrolling -- what we now think of as completely normal -- these are some of the fairly fundamental ideas of how someone interacts with these new devices." "At the heart of this lawsuit is this same issue, which is: How do I differentiate my product from the other guy’s in a market that seems to be rapidly moving?" said Stephen Baker, consumer technology analyst at NPD Group. "Each company wants you to be comfortable within their ecosystem." Samsung already scrapped a local search feature in some Galaxy phones and tablets in response to patent issues. Patent experts say it’s possible that a decision could force Samsung to take away other features or make them radically different, which is a disconcerting prospect for users who have grown used to that interface's look and feel. Mandour said Apple has stronger grounds to argue that it has been damaged because of lookalike design elements on Samsung devices rather than the alleged co-opting of functions; consumers are more likely to make a purchase decision based on how the phone looks than whether scrolling past a screen will create a “bounce” effect. If Samsung is entitled to damages from Apple, Rivette said the price of iPhones could be impacted “marginally,” although the company might decide against passing along that cost to consumers, given the profits it earns on the iPhone. "You’re looking at margins that are so huge that if you want to keep market share, you just eat it," he said. Over the course of litigation, Apple might seek a temporary injunction to block sales of some Samsung devices, a tactic in which it has had some success in the past. This would frustrate consumers who wanted to buy the phone or tablet, but it could turn out to be a boon for Apple; the tech giant is coming off a rare lackluster quarter, and it predicted that this quarter also will be only fair as customers hold back and wait for the new iPhone. "I think what you're really looking at here is if Apple can get an injunction, even temporarily for a couple months, then you’re into the Christmas quarter," Mandour said. "Apple needs a good quarter," and having its main competitor knocked out of the running could certainly help achieve that. 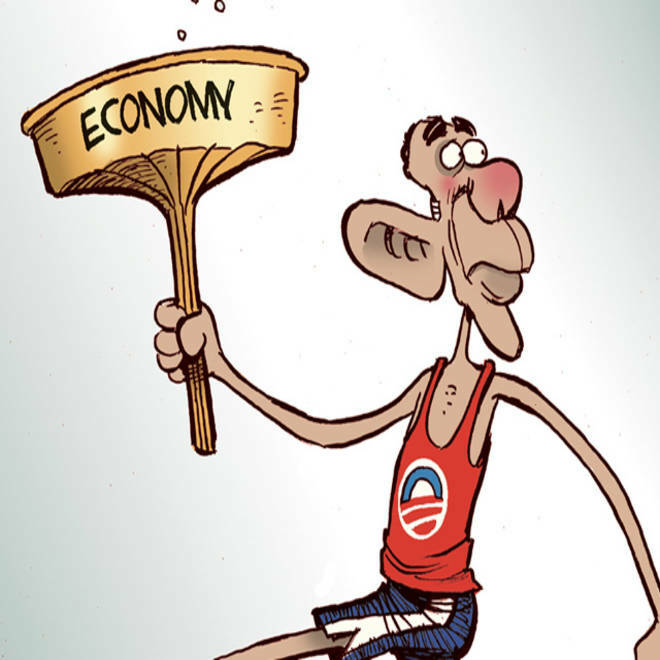 Cartoonists from around the country recap the best business stories of the week.